17.9.1928 - 31.3.2019 Passed away suddenly on March 31st after a brief illness. Father of David, Peter, Andrew and Jonathan. Father-in-law of Terri-Anne, Judy and Lynda. Grandfather of Michelle, Jessie, Monique, Jasmine, Benjamin, Todd, Charlie and Lucy. 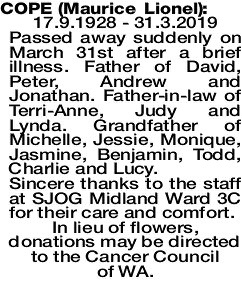 Sincere thanks to the staff at SJOG Midland Ward 3C for their care and comfort. In lieu of flowers, donations may be directed to the Cancer Council of WA.